The notion of a “public space” together with an “Art in a public space”, has acquired a new significance in the last period worldwide. The word “public” means democracy, and includes “clearness”, “openness”, “involvement”, “participation” and “responsibilities” not only from the governmental side towards people, but between people in general as well. Discourse about Art in a public space, is not only definition of the word public, but it is also realization of the idea of democracy. 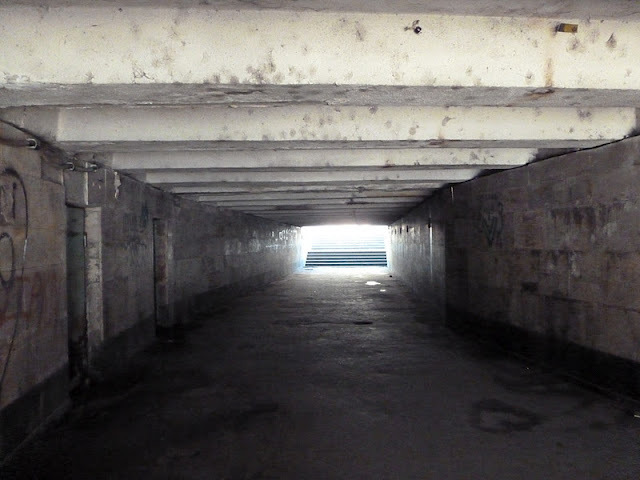 The exhibition project “undergo the parallels” has to be held in about 10 underground passages of Tbilisi, images can be seen under: https://picasaweb.google.com/Infogeoair/UndergoTheParallels?authuser=0&authkey=Gv1sRgCL–5rnw8uGFdQ&feat=directlink. An exhibition project “undergo. the parallels” will take place in Tbilisi pedestrian underground passages. After the collapse of the Soviet Union, these underground passages have experienced different stages of existence: first they were completely abandoned and became dangerous places of muggings and robbery. The outcome of this was that people entered them more and more seldom, choosing to cross streets loaded with traffic arbitrarily, which led to a significant death toll. Later, these undergrounds became places where alternative, unofficial selling points arose. The more efficient sellers developed kiosks, shops, gambling places etc. Some of these underground passageways developed their own life, parallel to “normal” city life in the open air. These passages somehow turned into spaces of meeting and communicating, the youth are gathering in gambling houses, some musicians and students meet to play and listen to the music, the shop keepers are in close contact with the passengers and potential customers. Today these undergrounds are still under development, in some of them new “organized” commercial infrastructures are built, some of them are under the danger of collision, also there appeared some passages which regardless of their necessity, has lost their practical function, and became place for garbage, or turned into public toilets. There are two direct goals to be achieved with the project „undergo. the parallels“: practical and artistic. In term of practical goals we hope to animate the population of Tbilisi to more frequent usage of underground passageways. For these artists will work directly on site in the passageways, some of the works will be displayed during the whole project period, but also temporal actions and performances will be held in different passageways… Project guide, which will inform about all the activities, will be spread out to general population. On the one hand activities carried out during the project will animate pedestrians to enter the passageways and on the other hand they will give an input to officials for improvement of the given situation. On the artistic level, site-specific works (light installations, sound installations, photography, street art etc.) produced especially for the passageways will address socio-political and concrete practical issues mentioned above. Tbilisi and Georgian audience is not used to art in public space and in participatory art. With the project “undergo. the parallels” we aim to confront the general public with unconventional ways of perceptions of art and engagement with it. Some artworks as street art, light installations, produced during the project, could also remain on-site and act as a long-term attraction in both practical and aesthetical ways for the passageways. The organizers do not hold responsible for the damage or permanent loss of the Art work, Due to the fact, that project is planned in a public space in Tbilisi. Next to the artistic value the priority will be given to projects which will not be expensive and technically difficult to realize. Selection procedure will take into consideration the overall cost of the piece of art to be exhibited. The artwork presented for the exhibition should be relevant to the city of Tbilisi and relate thematically to the underground passages. Deadline for submissions is March 2, 2012. UNDERGO.THE PARALLELS is part of the SPACES project supported by Eastern Partnership Culture Programme funded by the European Union.